This image was taken under a deadline to get ready for GSSP 2014. I've been following some tips online regarding tuning up the Orion ST80 budget telescope. Blackened the edges of the lenses. Pretty easy, just remove the retaining ring and drop out the lenses. Darken the edges with a Sharpie. Cleaned the lenses with microfiber rag with Methanol. This is my preferred method for lens cleaning. Does a nice job of removing fingerprints and pollen. When inserting the lenses, I made sure that they were seated squarely by rapping the scope body while holding it upright. Gravity ensured that the lenses rested solidly against the cell. Collimated using airy ring test with my 7mm Nagler. Even with two extension tubes, it didn't have enough travel to bring it to focus, so I had to let the extensions out a bit more. I found that the optics were pinched even though I had them loose earlier in the day. Temperature is a big factor! Next major step will be to remove/cut/grind off the screws that protrude into the light path. When looking at the bahtinov mask image, I can see lots of diffraction "curls" appearing. I don't have a method to grind the screws, I may try fitting a different screw/bolt or press a dremel into service. Future work may be to get a GSO focuser to replace the stock unit. This would allow using a reducer/flattener on the scope, further tightening star images. Already seeing improvement in star images. I removed the Gemini 1 electronics from the GM8 mount and now it's a simple push-to GEM. I had to adjust the RA gear mesh and tighten the motor to worm attachment. Everything is working smoothly now. I've also removed the 3-point rings on the Orion ST80 in favor of solid rings. They grip nicely and there's no slop. There's a new SSAG in the mix (old style). I did the same maintenance that I'd done to my earlier SSAG; removed the t-thread plate and hot glue the edge of the circuit board to the frame. This removes any possible flex within the camera. I'd done some work on the ST80 as well. I removed the lens cell and blackened the edges of the lens with a sharpie. I'd also over-tightened the lens cell and there seemed to be some pinched optics. Also, instead of using a UV-IR filter, I'd opted for a yellow filter! 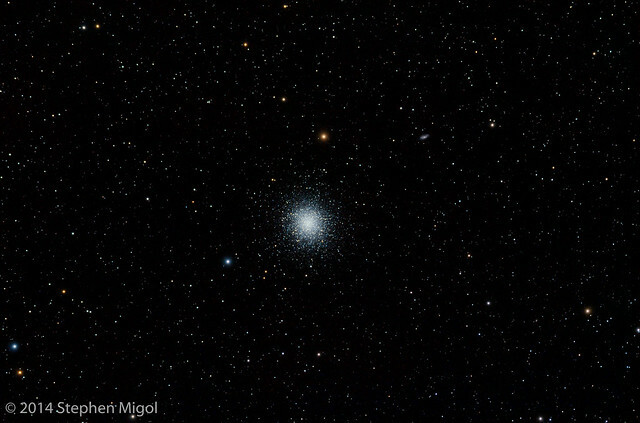 I've been very pleased with the star images and how well the focus can be made. With all the work, I set up the mount to track Vega/Lyra. Note the scatterplot. The horizontal band is RA and shows the range of the periodic error. I did turn on PEC training.